I was an early adopter of the “barefoot shoe” – At the time I was deeply immersed in the Paleo/Primal lifestyle, and so the concept that we evolved without shoes struck a chord with me. As with other aspects of the Paleo/Primal lifestyle, however, I’ve begun to question much of the theory which underpins the barefoot running movement, and in practice, I’ve found myself leaving the barefoot shoes in the cupboard more and more, particularly when I go out for longer trail runs. It therefore caught my interest, when I saw that Paul Ingram, of SaveYourself.ca just did an update to his Barefoot Running Science Review post. Q: Does running barefoot or in minimalist trainers reduce injury risk? Sorry, rather anti-climactic isn’t it! This does raise an interesting question however – what to wear on your feet (or not wear) when there is no conclusive evidence either way? I try and always base my decisions on the best available evidence at the time – but what if this evidence simply doesn’t exist? It is true that we evolved barefoot, and that all other animals on the planet seem to do perfectly well without shoes. To then presume that the addition of shoes must therefore be a bad thing is, however, succumbing to the naturalistic fallacy . The majority of the time, humans invent things to solve a problem. It’s unlikely that the first shoes were developed to accessorise someone’s outfit, but more likely to keep feet warm and/or protect them from sharp rocks and plants. Undoubtedly, some of our ancestors did a lot of barefoot running. I’m not sure this necessarily means we’re all born to run barefoot ultra marathons though. Humans have adapted to all corners of the globe, and in various places have become adept at many different skills – climbing, swimming, throwing, fighting. Looking at a few isolated groups of humans, then making inferences to the whole human race is a big jump. The terrain, pace, frequency and duration of the runs of a persistence hunter on the African Savannah is also likely very different to that of a modern sport runner. There’s also research which indicates that increased impact forces doesn’t necessarily equate to increased injuries, rather it may simply lead to increase bone density (though unfortunately I can’t find the link again!). So perhaps the evidence for the benefits of barefoot running isn’t so rock solid (to say the least) – does this mean there could be some utility to the many specialist running trainers out there? What about the different types of specialised running shoes on the market intended to “correct problems” such as over pronated, or supinated feet – could there be utility to these kind of trainers? Here we do actually have some evidence – though it runs contrary to what the “big running shoe” might have you believe! Any specialist “corrective” shoes they attempt to sell you are more likely to increase your injury risk, than they are to protect you! One Pair of Shoes for Every Occasion? So far, we’ve not got much to go on here have we! Nevertheless, let’s press on, and see if we can come up with a reasonable solution. Next up, we’ve got a whole range of activities which you could be doing in the shoes. This is where things get a bit muddier – are we talking about the benefits of barefoot shoes or barefoot running? Furthermore, even just within the categories of walking/running we’ve got a whole range of variables – terrain and distance being the main two, but also objective – are you running for pure enjoyment, or competition? Is speed or safety of utmost importance? A quick jog along the beach for fun is far removed from a 100km race through mountain trails – to claim that one shoe choice is the best solution for both makes me a little incredulous. Go with the shoe that feels right? In many scenarios, going with what feels right, is ill advised – smoking might feel great, but research indicates it’s probably not the best idea. To some people, training 7 days per week until they see stars and want to vomit feels right, to others, never leaving the sofa may feel right. Research would indicate that somewhere in between would most likely be of more benefit to both groups. When it comes to picking a running trainer, however, “going with what feels right” seems to be the best advice available at the moment. The Live Now, Thrive Later Philosophy, is to enjoy life now – to get the full advantages of whatever activity you are doing, as you do it – not to suffer now in the hopes or reaping some potential benefit in the future. If you have a pair of trainers in which you feel comfortable, you’re more likely to want to go out and run in them, and enjoy the process while you do. I found in that in really minimalist trainers, I was more prone to blisters, and often came home with tender bruises to my feet after longer trail runs over rocky ground. By switching to lightweight, but not quite minimalist trainers, I found I could still feel the ground beneath my feet, but not so much I was wincing as I went along! Perhaps over time, my feet would have adapted and toughened up through using the minimalist shoes – but is there really any benefit to me doing this? So far I see no evidence to indicate this. An additional benefit over mere comfort, is increased protection against acute injuries from rocks and sharp objects, which should not be overlooked. Not long after switching to trail runners, I felt a sharp pricking sensation in the bottom of my foot whilst running. On closer inspection, I found a nail embedded in the sole of my shoe. Had I been wearing minimalist or barefoot shoes, this could have been really nasty! You can only condition your feet so much – they’re never going to resist a sharp rusty nail, which could put you out of action for months (unless perhaps you’re some kind of super jedi barefoot monk). Proper trail shoes also have considerably better grip than barefoot shoes, minimising risks from slips and falls, particularly when descending steep slopes. I most definitely do think there are benefits to going barefoot, which I shall return to later. Contrary to what the marketeers might have you believe though, wearing a pair of “barefoot shoes” is not the same as being barefoot. One of the oft touted benefits of “barefoot shoes”, is that they increase proprioception, balance, and motor control, as a thick cushioned sole muffles and confuses the sensory inputs which should be picked up through the many 1000s of nerve endings in the soles of the feet. This is another claim which sounds very plausible, but again, doesn’t seem to stand up to scientific scrutiny. Researchers had participants of a study perform a single-leg jump landing test, either fully barefoot, wearing Vibrams, or in normal trainers. Other researchers found it doesn’t even take a barefoot shoe to diminish balance – just a pair of five toed socks significantly impaired people’s ability to balance on one leg.9 Sorry Yoga sock lovers! Even without the need for a scientific study, anyone who’s walked barefoot through grassy fields, soft sandy beeches, and sharp gravelly tracks, both barefoot and in barefoot trainers, will know that they are very different experiences. I like being barefoot. It feels good. Walking barefoot through the park enhances the sensory experience – not only can you drink in the beauty of nature visually, watching the trees blowing in the wind, and the clouds drifting through the sky, and aurally by listening to the birds singing and leaves rustling, you can also tangibly feel your connection to the the earth. Claims that being barefoot somehow has magical healing properties through “earthing“, are nothing more than pseudo-scientific nonsense, but this doesn’t mean it doesn’t have benefits. Trying to run down a steep rocky mountain side at 20kph completely barefoot, is an altogether different sensory experience. Maybe if you’re into ice-baths, week-long fasts and other forms of masochistic stoicism type health kicks, this might be your bag, but it’s not mine. 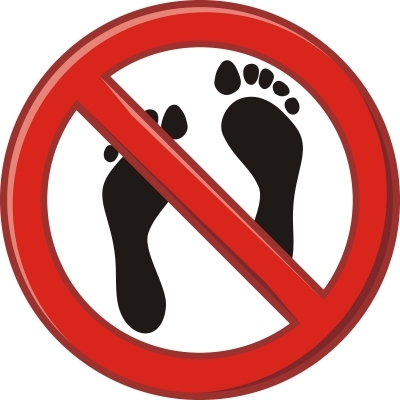 Personally, I go 100% barefoot whenever it feels nice to do so, and there is relatively little risk – I never wear footwear in the house, and walk around outside barefoot wherever possible. I like to do my strength training barefoot, and activities which require a lot of balance and coordination such as capoeira and slacklining. If going for longer walks I do like “barefoot” or minimalist trainers. It’s not the same as being 100% barefoot, but for my soft westernised soles it’s a good compromise. A 100% barefoot walk through the woods would be an ordeal – a good challenge once in a while perhaps – but not fun on a regular basis. A little protection still enables some nice feedback, enhancing that connection to the earth and the all round sensory experience, whilst also allowing me to enjoy the view as opposed to having to stare fixedly at the path below my feet. When running I go for a basic running shoe, with moderate protection, and a minimal drop – my personal favourites at the moment are my inov-8 f-lite 195s , or for more serious/muddy conditions the inov-8 x talon 190 . I simply enjoy running much more in these shoes than I do in the more minimalist versions – I can go further and faster, without bruising and blistering my feet, plus I have more grip. As mentioned before, the x-talons also saved me from a nail through the sole of the foot, for which I am very grateful! I’m sure that ultimately, with enough time and dedication I could condition my feet to be able to run through the woods in Vibrams, or perhaps even totally barefoot, the latter of which in some respects I think would be pretty cool. There are however, also many other things in my life which take priority, so I simply don’t have the time nor inclination to do so. Do you need to learn (or re-learn) how to run? This is an interesting question, again to which I’m sure more research is needed. Of course, one can argue that it is the use of modern cushioned trainers which facilitate this kind of striking pattern – though as we’ve seen in the studies cited earlier, some people still heel strike in minimalist trainers, and it’s equally possible that one could heel strike barefoot on softer surfaces. One could easily heel strike across soft earth and grassland for example. When it comes to foot strike – be it forefoot, midfoot or heel strike, there’s no real evidence to indicate one is any better than another, either in terms of efficiency of injury prevention. Based on this lack of evidence, should simply forget about running technique altogether? IMHO, all we can conclude from these studies on running efficiency, is that a heel strike is equally or slightly more efficient than a fore/midfoot strike when running on a treadmill. Anyone who’s run both on a treadmill and outdoors will know it’s a very different experience. I’m in no way convinced the results carry over at all. Next, let’s take a look at some elite runners in action. Here we have Usain Bolt, and below, Kilian Jornet – they don’t come much more elite than these two, at the opposite extremes of the distance spectrum. Of course, it doesn’t follow that trying to emulate the style of an elite athlete will necessarily work for you. It could be that certain individuals are genetically predisposed to run fast with a forefoot strike. What I have encountered personally, however, is that when I mindfully run with more of a midfoot strike, high heel lift, and foot landing under my centre of gravity, I go faster. Walking is the most efficient form of ambulation, and achieves this through a heel strike. Sprinting is the fastest form of ambulation, and necessitates a forefoot strike. It makes sense to me that there would be a spectrum in-between these two extremes where efficiency is gradually diminished in exchange for higher performance. Here’s another clip of Kilian Jornet, this time in the final mile of the infamous Western States 100 mile mountain race. In it you can see he’s much more flat footed than the previous show reel piece, though still landing under the body. Anyway, as I say, you can’t infer that just because many elite athletes run with a forefoot strike, attempting to mimic them will turn you into a world champion, it does indicate to me however, that more research is still needed (as always…). Go to a park, or other venue which is popular with runners. Find a popular stretch with a bench, take a pew and watch them go by for quarter of an hour or so. My bet is, even without a masters in sports science, high speed video camera and movement analysis software, you can spot the difference between those which might fall into the elite category, and those which… well, let’s just say, don’t. The really sad thing is, these guys actually move better than many of the people out there on the streets. You can see that really, all the actors have good body awareness (probably a necessity of the profession), and are in control of their actions. A large proportion of the people you’ll see in the park appear to have little to no co-ordination over their own bodies. It seems to be a miracle they actually move in their intended direction. While I haven’t seen sufficient evidence to say an individual should try and adopt one particular style of running, or try and intentionally alter their foot strike pattern, I do think that a lot of runners would benefit from being more mindful of their movements. Head trainer at Sweat Shed in Manchester Matt Leigh has a saying which I like: “Make it Look Pretty”. We all have different physiognomies, I doubt there’s a one size fits all running technique, but I do think that there’s an opportunity for everyone to improve their own personal efficiency and/or performance through mindful practice – exactly what that form will look like is hard to predict, but I’d be willing to bet you and others will be able to spot it (and maybe you’ll be less likely to get mugged in the park). I also have a sneaking suspicion intent may play a big part in all this. I’ve been putting runners in italics. This is because most people out there aren’t really running, they’re jogging. Under my definitions, running is a form of movement intended to get us from A to B as rapidly as possible. Jogging on the other hand, is a form of exercise intended to burn calories/stop our hearts from atrophying. A lack of efficiency would in fact aid these goals! I wonder, how many of these novice runners with inefficient gaits and rear foot strikes, would look considerably more like Usain Bolt if you released a pack of snarling rottweilers on their heels? As of May 2014, there is no evidence to indicate that any one type of running shoe, nor any one foot strike pattern, is superior to any other in terms of performance, efficiency or injury prevention. The best advice currently available seems to be to choose a pair of shoes in which you feel comfortable, and don’t worry about which part of the foot you strike the ground with. In terms of injury reduction, the biggest causes of the most common issues appear to be TMTS – Too much too soon! If you are new to running, or have had a lay off, start back gradually, listen to your body, and don’t try and over do it. When you do run, do so mindfully, and with intent. Don’t think about the work which needs doing on the new house, the overflowing email inbox, or those unpaid electricity bills. Focus on creating that mind body connection, and being in the moment. The only external focus should be on the immediate environment through which you are navigating. When not running through the streets or trails, try and spend as much time barefoot, or as close to barefoot as possible. Again, always try and be mindful of that brain-body connection. Use that proprioceptive feedback through the 1000s of nerve endings in the soles of your feet to help ground you (not earth you…), and enhance your ability to co-ordinate your body and interact and move through your external environment as smoothly, efficiently, and as elegantly as possible! Most importantly, whether you’re running, jogging or walking, barefoot or shod, remember to be in the moment and have fun! Effects of foot strike on low back posture, shock attenuation, and comfort in running. Delgado T, Kubera-Shelton E, Robb R, et al. Rearfoot striking runners are more economical than midfoot strikers. Ogueta-Alday, Rodríguez-Marroyo JA, García-López J.